“The mutual visits of senior officials in the two countries during the last period came in a higher mode as the current conditions, witnessed in both countries, require intensified efforts,” Turk-Abadi said in a press conference held in Damascus on the 40th anniversary of the victory of the Islamic revolution in Iran. He added the latest visit of the first vice president of Iran Eshaq Jahangiri to Damascus has achieved a great success that pushed bilateral cooperation forward during which a big deal of agreements have been signed. 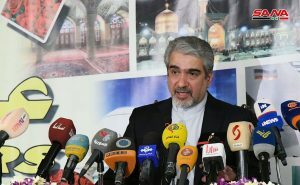 “The visit of Syrian Deputy Prime Minister, Foreign and expatriates Minister Walid al-Moallem to Tehran also came in the framework of cooperation as officials in the two countries discussed the latest developments in the region and the world,” the Ambassador stressed. Turk-Abadi pointed out to a serious plan to develop connection among Iran, Syria and Iraq concerning power, gas and oil, air and land routes to boost economic and trade relations among the three countries.